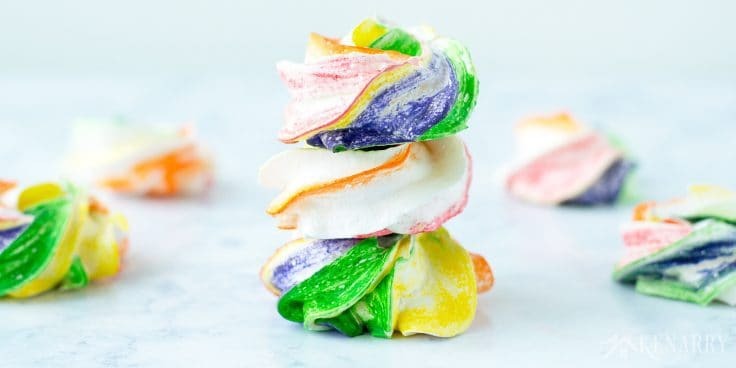 These Rainbow Meringues look fancy, but it’s so simple to make this easy recipe. They’re a fun dessert for St. Patrick’s Day, Mardi Gras or even a rainbow unicorn birthday party! Hey there! My boys love when we create fun and festive food for different holidays throughout the year. 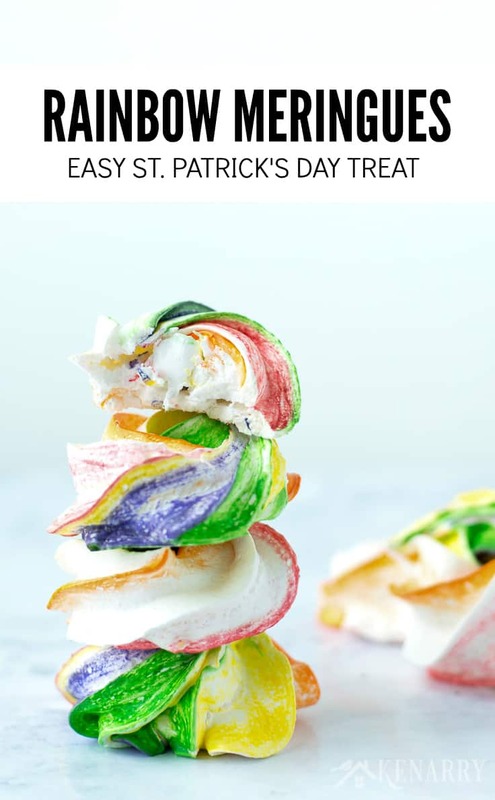 So I’m sure they would be thrilled if we’d make this easy recipe for Rainbow Meringues for St. Patrick’s Day. Wouldn’t they be such a festive and fun dessert for St. Patrick’s Day, Mardi Gras or even a rainbow unicorn birthday party? These Rainbow Meringues were created by my friend and colleague, Meaghan at Cook. Craft. Love. She’s a genius when it comes to easy holiday recipes like her Chocolate Caramel Cupcakes with Rainbow Frosting, her Slice and Bake Rainbow Sugar Cookies — and for the adults, her Bailey’s Irish Cream Chocolate Mousse. I’ve never made meringues before, but Meaghan says it’s so simple to do. You don’t end up with wasted egg yolks. Meringue powder is more stable and less finicky than raw egg whites. Plus meringue powder has a long shelf life. So even if you don’t use it very often, it won’t go bad on you for about 2 years. If you don’t have or absolutely positively don’t want to purchase meringue powder, no worries! 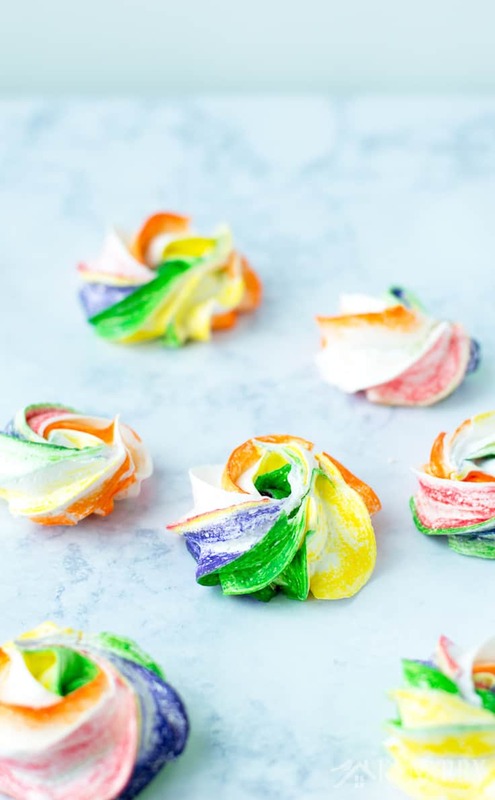 Meaghan said you can replace the meringue powder and the water in this Rainbow Meringues recipe with 3 egg whites and a 1/2 teaspoon of cream of tartar instead. 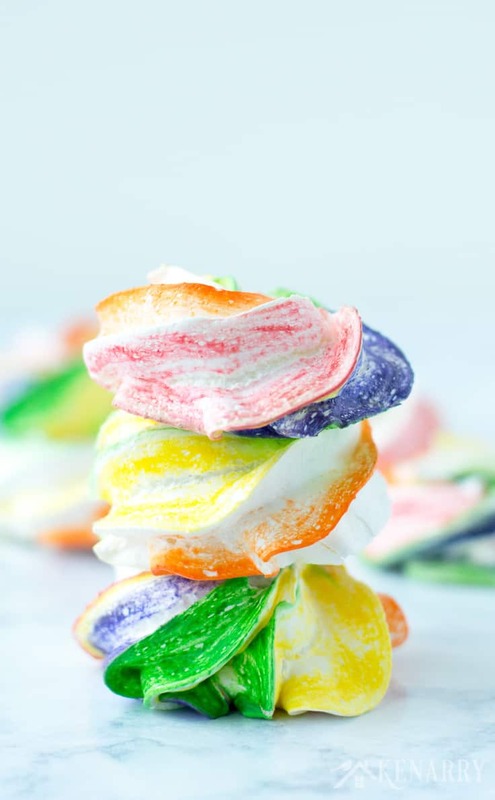 Making Rainbow Meringues is a fun and festive dessert for a St. Patrick’s Day party or treat. 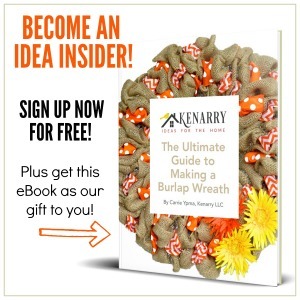 They’re so simple to make, but will look fancy on a cookie tray or bagged up as gifts for friends. You just need a few baking supplies and four ingredients. 1. Prepare the meringue batter. First, preheat your oven to 250 degrees. Then place your whisk attachment on your stand mixer. In the bowl for your stand mixer, add the water then add the meringue powder. It’s very helpful to add the water first and then the powder because meringue powder is VERY fine. Mix on medium-high speed, stopping to scrape down the bowl every few minutes until you reach soft peaks in the batter. Once your batter is forming soft peaks, turn the mixer up to high speed. Then very slowly add the granulated sugar one spoonful at a time. It’s very important to do this step slowly otherwise, you’ll deflate the mixture. Continue adding the sugar one spoon at a time until all of it has been completely incorporated into the batter. Once the sugar has been fully incorporated, stop the mixer and carefully scrape down the side of the bowl with a spatula. 3. Keep mixing the meringue. Continue mixing the meringue on high speed until all the sugar has dissolved. To test it out, try to rub a bit of the meringue between your fingers to see if it still feels gritty. The process of dissolving the sugar should take about 10 minutes. Don’t worry if you can’t get ALL the sugar to dissolve. Meaghan says sometimes she can’t! She said a few granules will be fine and will bake out in the oven. 4. Create the rainbow effect. To create the rainbow swirl effect, first grab your large piping bag. Cut off the tip of the bag with scissors. Then insert the 1 M piping tip in the bottom of the bag. Next dip a skewer or chopstick into the red gel food coloring. Draw the skewer or chopstick up the inside of the large piping bag, starting in the tip, to create a thin, even line of color. You really won’t need as much as you might think. Meaghan says a thin, streaky line is perfect. Then repeat this process for each color in the order of the rainbow. So next is orange, then yellow, green, blue and finally purple. If you want white space on your Rainbow Meringues place the colors further apart. For less white, just put the food coloring lines closer together. 5. Make the Rainbow Meringues. Now fill the large piping bag with the meringue batter. Be careful not to smear the colors too much as you do so. Pipe the meringues onto a baking sheet lined with parchment paper using a circular motion. 6. Bake and enjoy the Rainbow Meringues. Bake the Rainbow Meringues on the bottom rack of your oven at 250 degrees for 45 minutes. 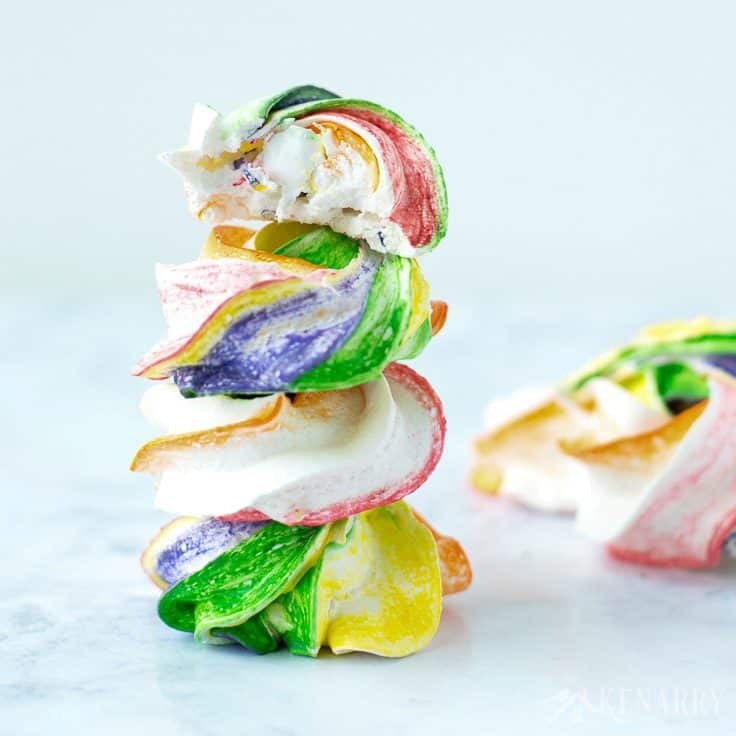 Allow the Rainbow Meringues to cool before you serve them. 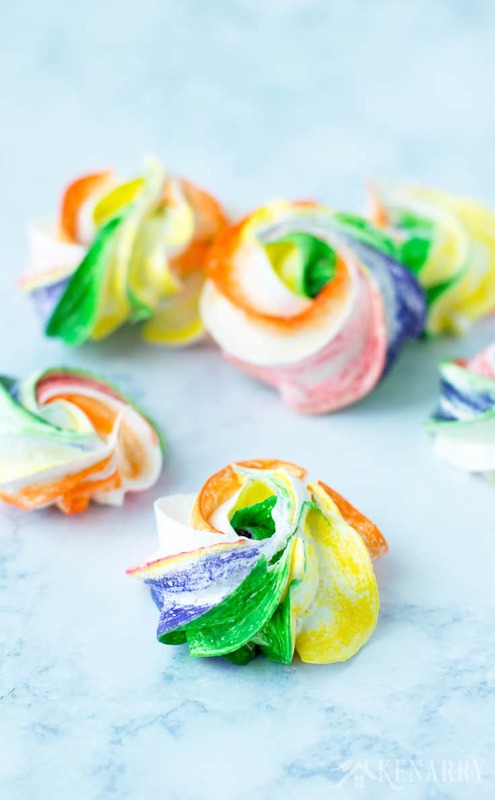 Rainbow Meringues look fancy, but it's so simple to make this easy recipe. They're a fun dessert for St. Patrick's Day, Mardi Gras or even a rainbow unicorn birthday party! Preheat oven to 250 degrees and in the bowl of a stand mixer fitted with a whisk attachment add water and meringue powder. It helps to add the water first and then the powder because meringue powder is VERY fine. Mix on medium-high speed, stopping to scrape down the bowl every few minutes until you reach soft peaks. Once you reach soft peaks, set the mixer to high speed and add the sugar one spoonful at a time (Do this slowly so you don't deflate the mixture) until completely incorporated. Once fully incorporated, stop the mixer and scrape down the side of the bowl. Continue mixing the meringue on high speed until all the sugar has dissolved when you rub a bit of the meringue between your fingers. This should take about 10 minutes. Cut off the end of a large piping bag and insert a 1M piping tip into the bag. To create the rainbow swirl effect dip a skewer or chopstick into the red gel food coloring and draw it up the side of the piping bag, starting in the tip, to create an even line of color. NOTE: You won't need as much as you might think. A thin, streaky line is perfect. Repeat for each color in the order of the rainbow. If you want white space place the colors further apart, less white put them closer together. Pipe the meringues onto a baking sheet lined with parchment paper. Bake on the bottom rack at 250 degrees for 45 minutes. Allow to cool before serving. Right before you put the Rainbow Meringues in the oven, top them with colored sprinkles. If you like Peppermint Meringues, you could add 1/4 teaspoon of peppermint extract to the batter before you put it in the piping bag. 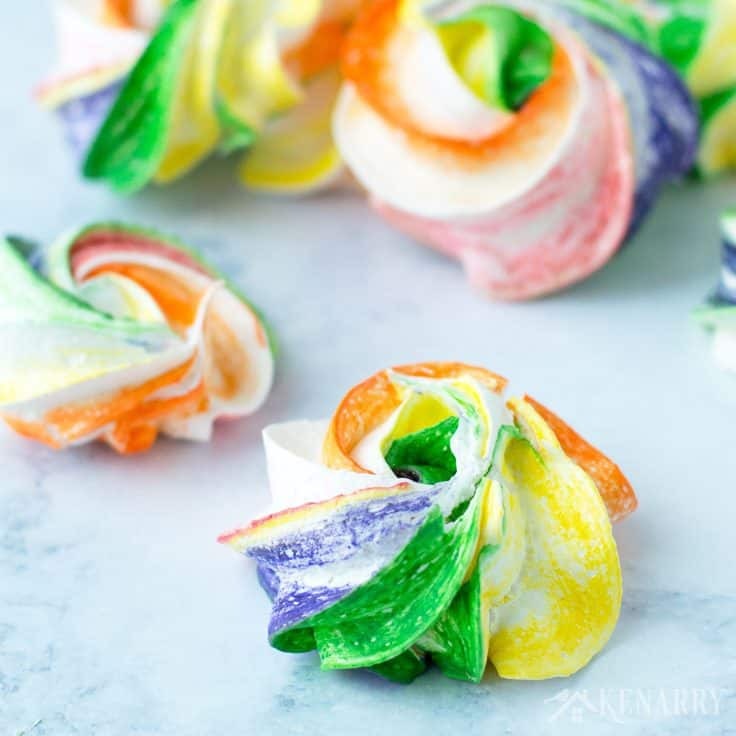 Put the Rainbow Meringues in small cellophane bags to use as St. Patrick’s Day party favors or as treats for friends and neighbors. Tie the bags closed with green curling ribbon and attach a St. Patrick’s Day party favor tag. Rainbow Meringues would also be a fun treat for a Mardi Gras party or a super colorful birthday treat. Rainbow and unicorn birthday parties are incredibly popular themes right now especially with little girls. Also, Meaghan tells me that meringue powder can be re-hydrated and used in recipes that require a lot of egg whites, like angel food cake. She says it’s also really good for making royal icing to decorate cookies. You just substitute 2 teaspoons of meringue powder plus 2 Tablespoons of water for every egg white in your recipe. 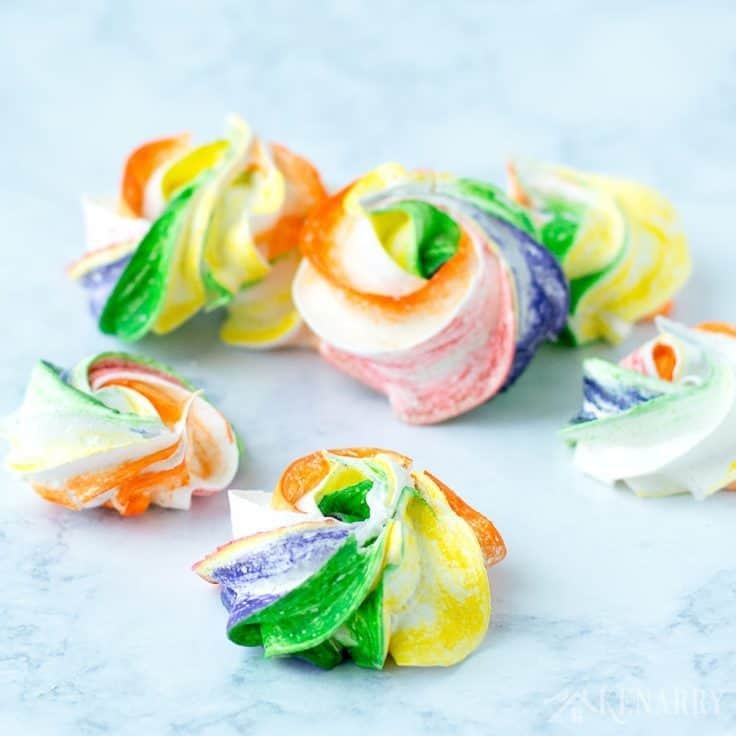 How else would you decorate or serve these Rainbow Meringues for St. Patrick’s Day? Please comment below and share. We’re always looking for new ideas!